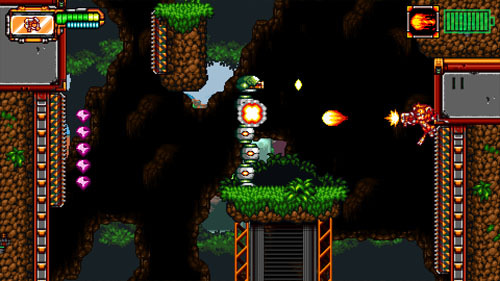 At the start of the game, the player is able to choose between three playable characters, called Predators, and select between normal or hard difficulty modes. Unfortunately, there is no way to swap characters or play as the other characters once the game begins, so you’ll need to figure out which Predator you like best and stick with her. All three have the same movement abilities but somewhat different weaponry. 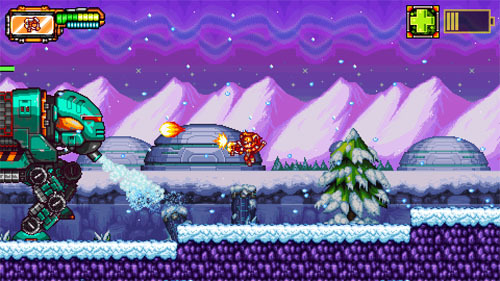 Erika is able to shoot a steady stream of fireballs across the screen and her special attack is a fireball that shoots in a straight line and drops flame spouts along the ground as it goes, allowing you to take out enemies on the ground, or fire it over a ledge to get the drop on enemies below. 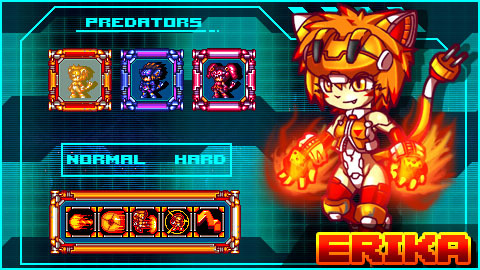 Zeta fires pairs of electrical pulses that spread out a bit as they move across the screen, and she has a special attack that sends an energy blast to the left and right. And Neva fires a fast stream of somewhat inaccurate purple projectiles, machine gun style, and her special attack is a huge laser blast. 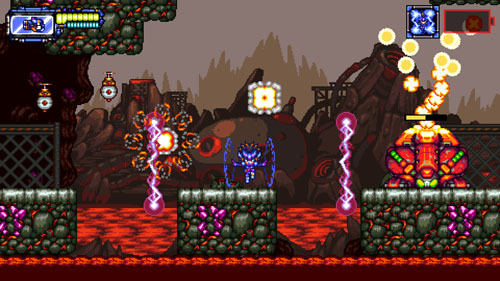 At the start of the game, six stages are visible, but they must be completed in order, and three more stages are unlocked in succession once the first six have been completed. Each of the first six levels features five huge gems (worth 400 units of currency) and one passive buff, most of which are placed in hidden or hard-to-reach areas. An end-level summary screen shows which of these items were discovered, and levels may be replayed to find them all. Each of the six passive buffs is optional, but they can give you a leg up on your adventure. For instance, one buff gives you a longer invincibility period after taking damage, another lets your energy meter charge more quickly so you can make more use of your special attacks, and one simply doubles the value of any currency you collect. Currency is used to purchase new firing types for your primary weapon, as well as to unlock new special attacks and movement abilities once you reach a high enough “origin level” (more on this in a bit). Currency is also used to continue the game when you die, so you risk missing out on a desired upgrade if you make too many mistakes. Continuing doesn’t cost a lot, but it can add up if you die several times in succession. Even so, checkpoints only appear on screen transitions, and there can be quite a distance between them, resulting in a lot of repeated gameplay if you fail. Levels are also quite long – at least on a first attempt – so you might be looking at 20-30 minutes of play before you make it back to the safety of the level select screen. Many levels offer branching paths to allow for a bit of exploration, usually to find the huge hidden gems or passive buffs, and this can add quite a lot to level completion time in the early going. That said, returning to previous levels – especially with new movement abilities – allows you to zip through them much more quickly. This is especially true once you unlock abilities that let you move around in the air, such as a double jump and an air dash. 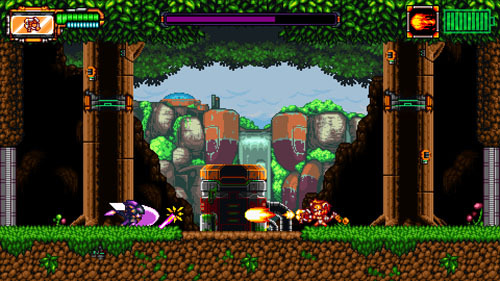 Each character begins the game with a snappy 3x variable jump and the ability to fire to the left or right and use special attacks. Characters can also dash in continuously in a straight line, which is quite different from most games that offer a short-range dash ability. Here, you can hold the DASH button to greatly increase your speed while running and jumping, and it lasts until you take damage or let off the button. This is balanced by the fact that you cannot turn around while dashing, nor can you double jump unless you let off the button first. You also cannot string air dashes and double jumps together. An 8-unit energy meter appears in the upper left corner of the screen, but you actually have a lot more than eight units of health, as the meter is layered. The meter starts out green, turning yellow as you take damage. Once the meter is fully yellow, taking additional damage turns it red, and depleting the red meter results in death. So in actuality, you have a total of 24 units of health, with weaker enemies only depleting the meter by one or two units, and tougher enemies and environmental hazards draining a full eight units in one go. Health pickups restore eight units each, and these may be found within the levels or occasionally as enemy drops. Beneath the health meter is an energy meter which powers the alternate firing types for your primary weapon. These firing types may be unlocked via the menu at any point in the game, and they include things like a 3-way shot, bouncing projectiles, and concentrated short-range blasts. 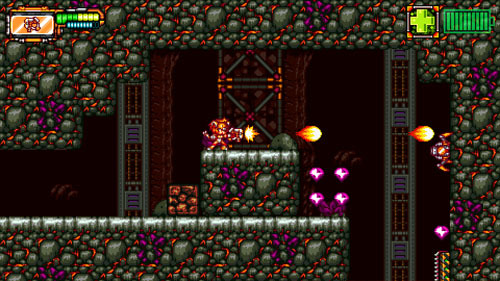 There are pickups within levels to recharge the meter, but most enemies are defeated readily by the player’s continuously-firing default weapon. 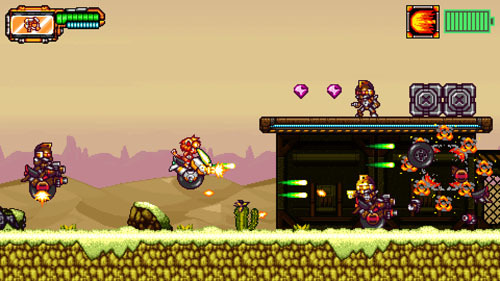 What makes the alternate firing types special is the fact that some of them allow you to target otherwise unreachable enemies, and certain projectiles able to penetrate solid objects or enemies, allowing you to take out foes more easily if you think strategically about your weapon loadout. Finally, there is a battery in the upper right corner of the screen that meters your special attacks and other abilities. Most special attacks deplete the meter completely in one shot, and the meter refills over time at a steady rate. Other abilities assigned to this same slot include health restoration (at the cost of currency) and a modifier that makes all of your weapons temporarily stronger while the battery slowly drains. 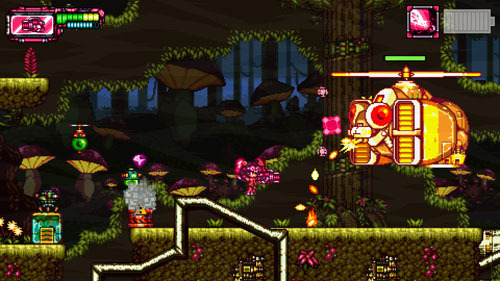 Once drained, the player must wait for the battery to refill before special attacks and abilities can be used again. Enemies come in all shapes and sizes… well all robotic shapes and sizes anyway. Lots of robotic monstrosities have it out for you, including humanoid bots with guns, shielded enemies that can only be attacked from behind or damaged with a special attack, insectoid bots like hovering bee-like drones or towering centipedes, beefy war machines, and hulking contraptions meant to simply stand in spectacle. Most fall to simple stand-and-shoot techniques, but some require a bit of extra finesse, particularly those that take multiple hits to destroy. 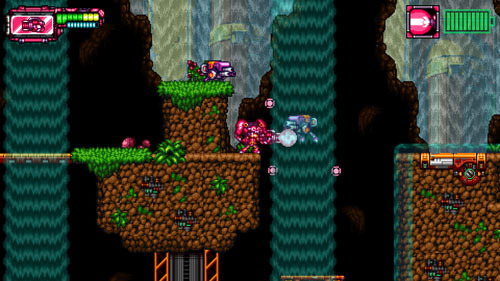 A miniboss appears at the midpoint of each stage, and an end-boss appears at the finale, and these offer more complex movement patterns and take substantially more damage, as you would expect. All of these take place in confined arenas, although some of these arenas extend beyond the boundaries of the screen. This is a good time to whip out your alternate firing weapons and unleash special attacks to deliver damage as quickly as possible. Each boss has a few attacks at its disposal, and they don’t just cycle through the same patterns over and over, so you’ll need to pay attention to their movements. 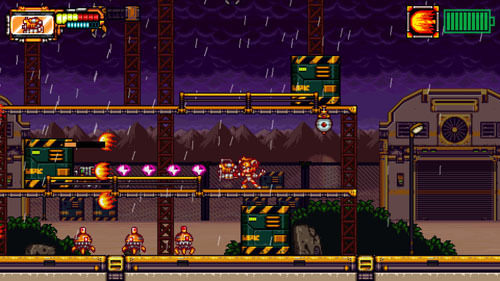 Some levels have minor puzzle elements, such as pushing crates to create platforms and reach high ledges, activating switches to trigger spouts of liquid that push you upwards, or using magnets to pull steel crates through the air. Several levels mix things up with vehicle sequences, although most of these are in the back half of the game. 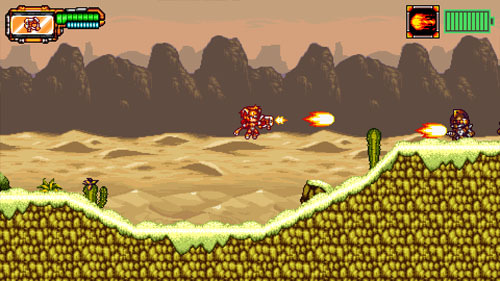 The earliest vehicle sequence sees you riding a one-wheeled motorized cycle through the desert, taking down regular enemies and some that are riding cycles of their own. You can speed up, slow down, and turn around, but strangely, doing so causes your motorized enemies to do the same, which is a bit counterintuitive, and it can also cause these guys to slam into you quickly when you turn around. Interestingly, these cycle sequences still offer the same opportunities for exploration, with many paths inaccessible without the cycle, so you’re encouraged to hop around a bit and see what the level has in store. 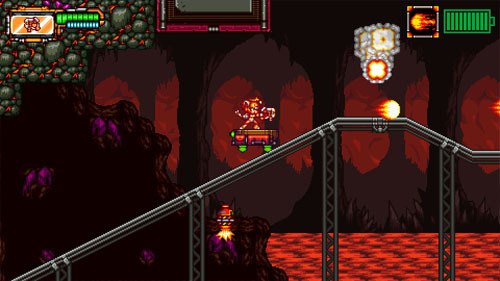 The same can be said for mine cart levels – which are usually throwaway linear experiences in other action games – where you can control left-to-right movement and hop between carts to reach distant platforms. Something that’s not readily apparent at the outset is your “origin level”. 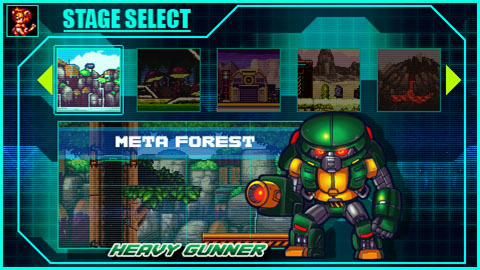 Many purchasable upgrades are locked at the start of the game until you reach a certain origin level, ranging from 1-4. 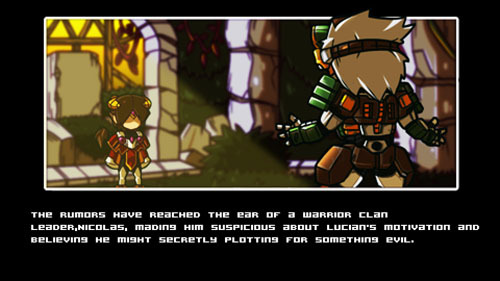 You attain origin level 1 in the first level when fighting against a miniboss named Aeon. However, you go most of the rest of the game without attaining the next origin level… at least unless you explore off the beaten path and discover Aeon again for an optional boss encounter. There are some narrative elements to the experience, but unfortunately they’re insubstantial to the experience and poorly translated. That said, they’re no more or less exciting than any other actioner of this type, so you’d likely be skipping through the short dialogue sequences regardless. Aesthetically, the game is quite lovely and colorful, and there’s quite a lot of visual variety from one themed area to the next, which gives them each a unique feel. The game is accompanied by an appropriately retro-style soundtrack. Metaloid: Origin was developed by RetroRevolution , a studio founded in 2013 by artist/designer Tharathon Wattanavikrai and programmer Alberto Dolci, with Tharathon based in Khonkaen, Thailand and Alberto based in Italy. 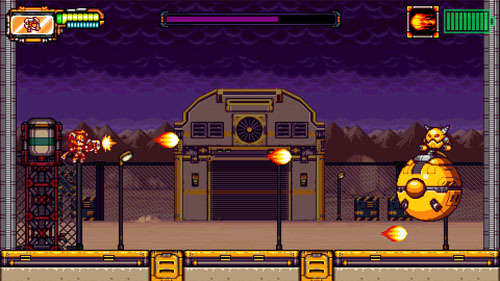 The duo have previously released the mobile titles Chicken Duty and Metaloid: Reactor Guardian. Music for the game was composed by Kamil Sudrajat. 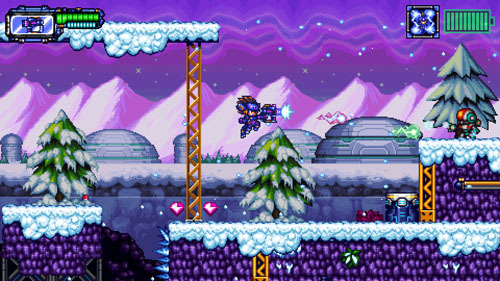 Prior to this, the studio released Metagal, a Mega Man-inspired actioner with a similar visual style.